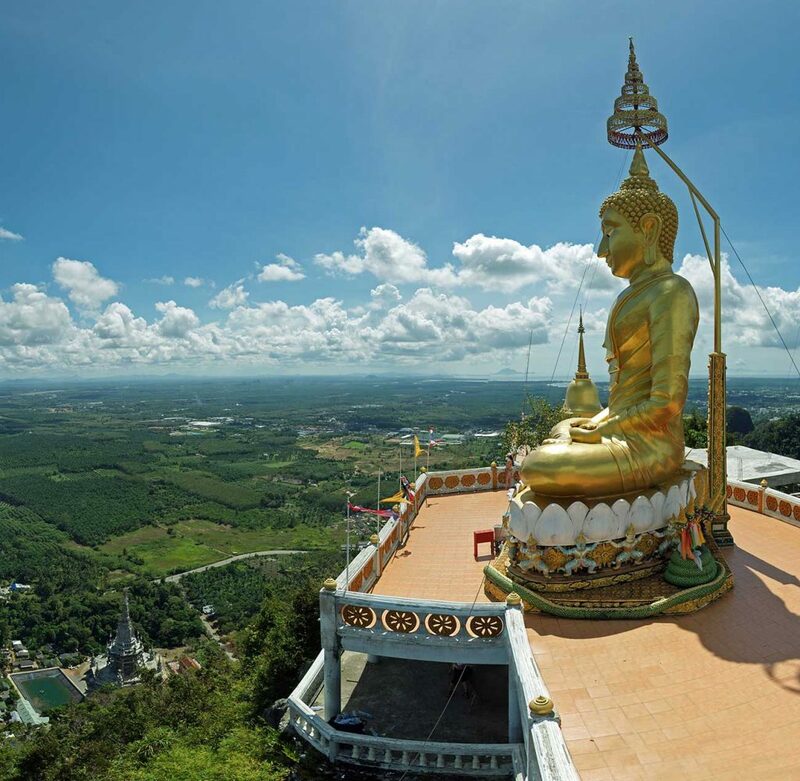 Krabi is a huge province in southern Thailand with a lot to do. No matter what you decide to do, Krabi is beautiful and cheap. Can you ask for more? We know you’ll love it! We stayed in an Airbnb in Ao Nang, Krabi. Just a 15 minute walk to the beach! 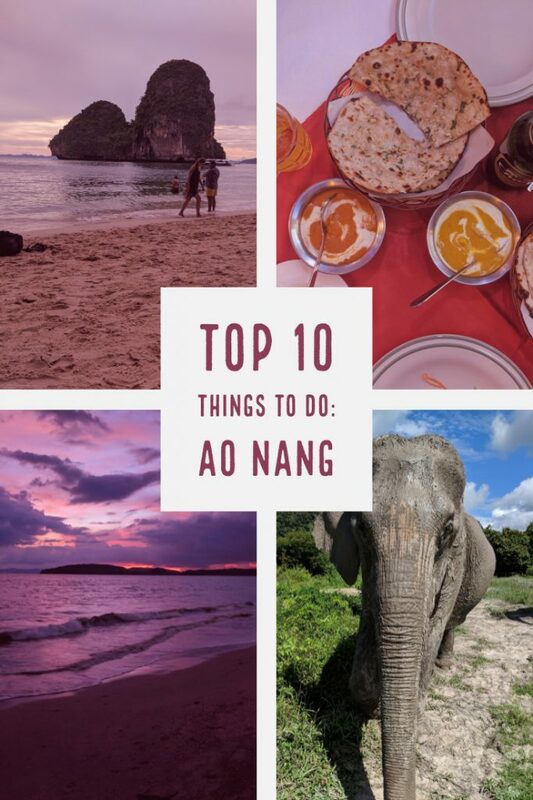 We share our top 10 things to do in Ao Nang and the surrounding area below! 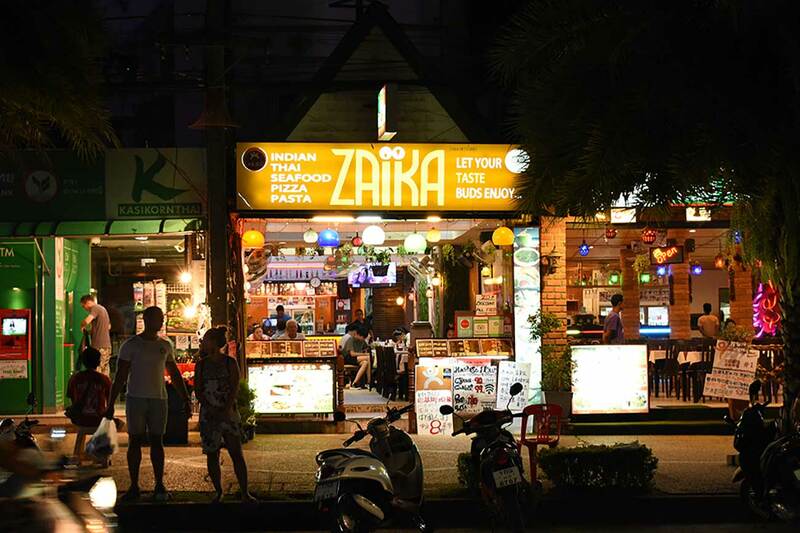 There are so many different types of food to be had in Ao Nang. There is, of course, Thai food and we’ll just go ahead and suggest you check out Ao Nang Boat Noodle. They have a huge menu and everything we had was delicious. 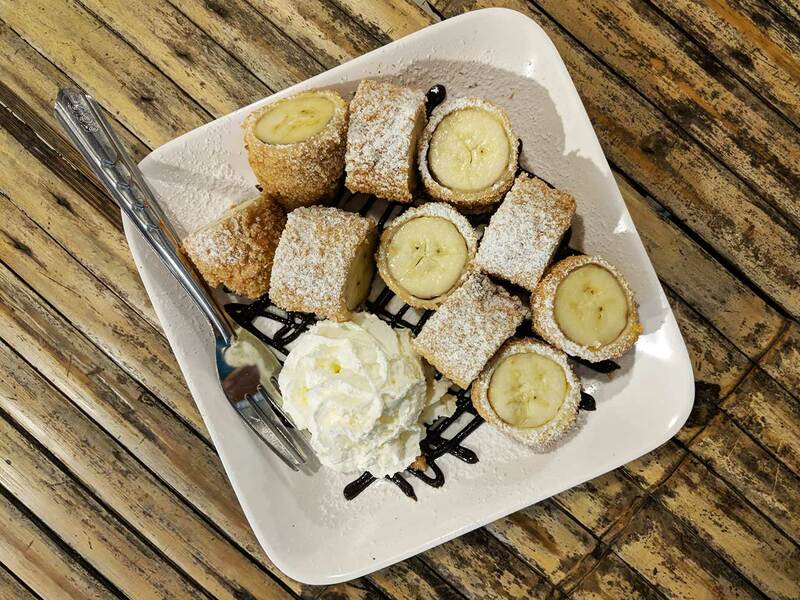 You MUST try the crispy bananas. They are to die for. Oh, and this restaurant was the cheapest one we could find. We left feeling very satisfied every time and so did our wallets. There was a stretch of 3 days where we really wanted pizza so we began our search! The first night we walked into an Indian restaurant with a pizzeria sign hanging from it and decided to try it out. We searched the menu for pizza but found nothing and ended up ordering Indian food and never looked back. The next two nights we were still craving pizza and ended up in 2 other Indian food restaurants ordering Indian food, even though they did have pizza on the menu that time. 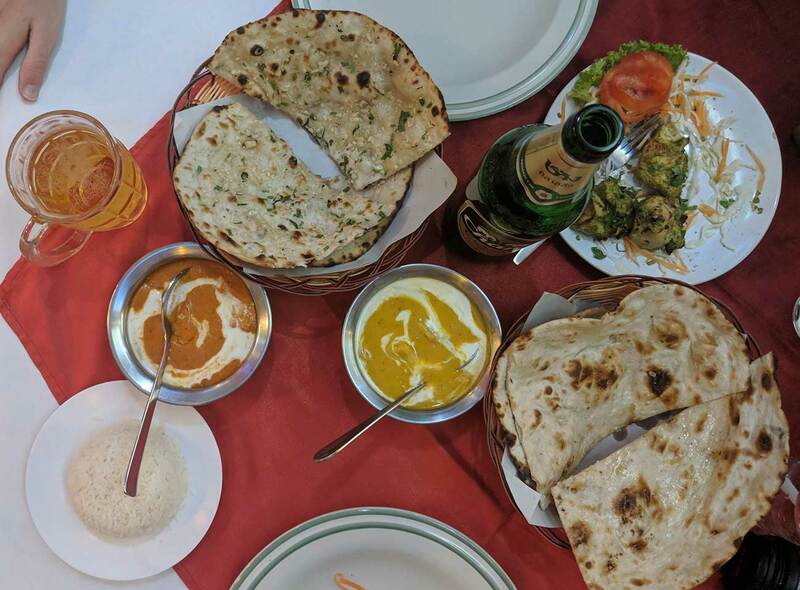 Ultimately, what we’re trying to say is: Indian food. Eat it. We recommend Zaika’s, Tandoori Nights or Bombay Palace. You will not be disappointed. Just order the butter chicken curry and thank us later. Need to satisfy that sweet tooth? You’re in luck! 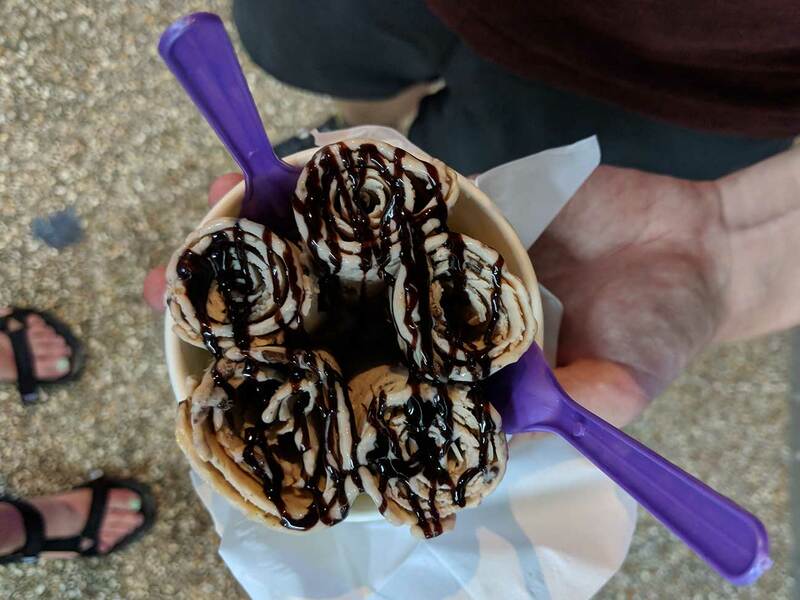 Almost everywhere you look in Ao Nang you will find Thai pancakes or rolled ice cream. Want our recommendation? Try the Nutella and peanut butter pancake and the chocolate banana ice cream. Maybe it’s the fact that we came here with no expectations of great food and were blown away, but take our word for it. There is some amazing food here in Ao Nang. Where do we start? There are so many to choose from, but most are only accessible by boat. This is a little annoying at times when you just want to walk to the beach, but no worries! The closest stop to a pristine beach, Railay Beach, is just a 10 minute longtail boat ride away and is cheap too! 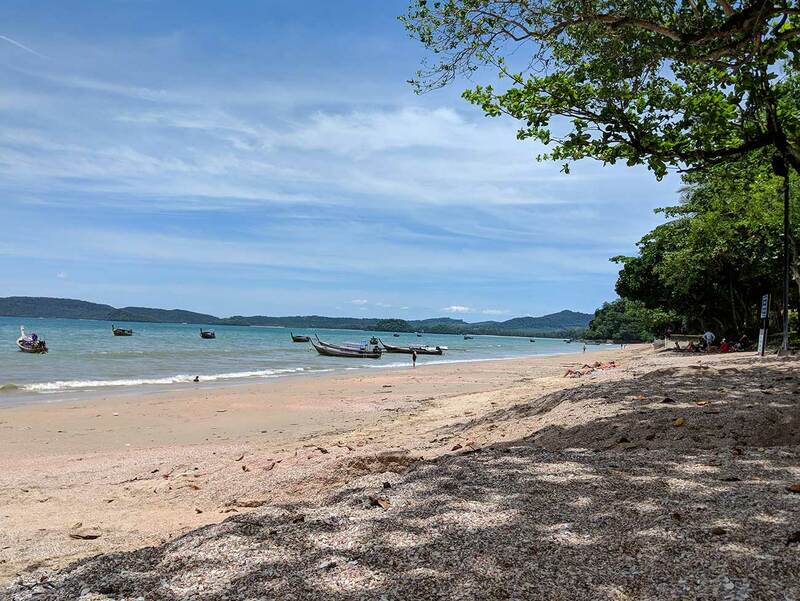 For more on Railay Beach check out our post here! There are many other islands out there with beautiful beaches but look into tours for those or if you really want to enjoy an island, take a longtail boat and spend the day! Ao Nang has its own stretch of beach, called Ao Nang Beach. This is a fairly large beach right next to restaurants and massage parlors so you can’t beat its convenience. However, be prepared to see some trash. 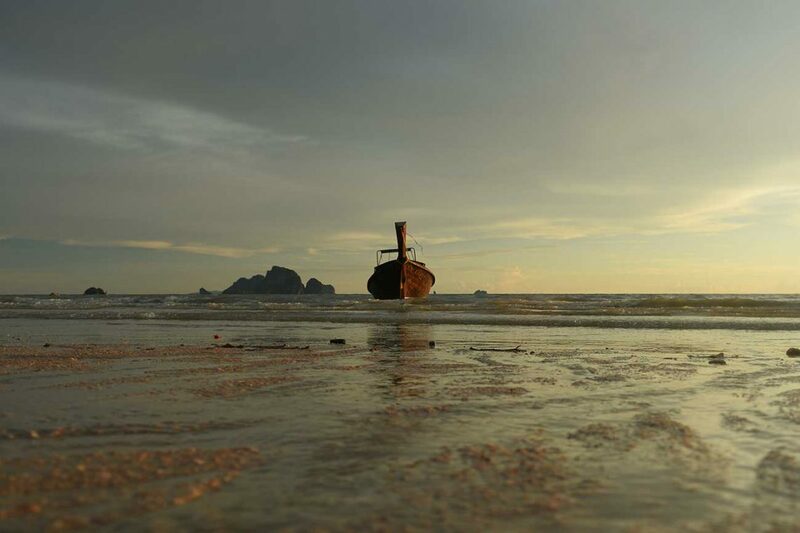 Some days were worse than others but the cleanliness of Ao Nang Beach isn’t quite up to par. If you’re looking for a longtail boat to an island or Railay, you will find the ticket stand here! Further up the coast from Ao Nang Beach is Noppharat Beach. We went here just one day and not for long. The tide was high but the trash was a lot worse at this beach. If you don’t get the chance to take a boat to an island or Railay (shame on you), then we recommend kicking back at Ao Nang. 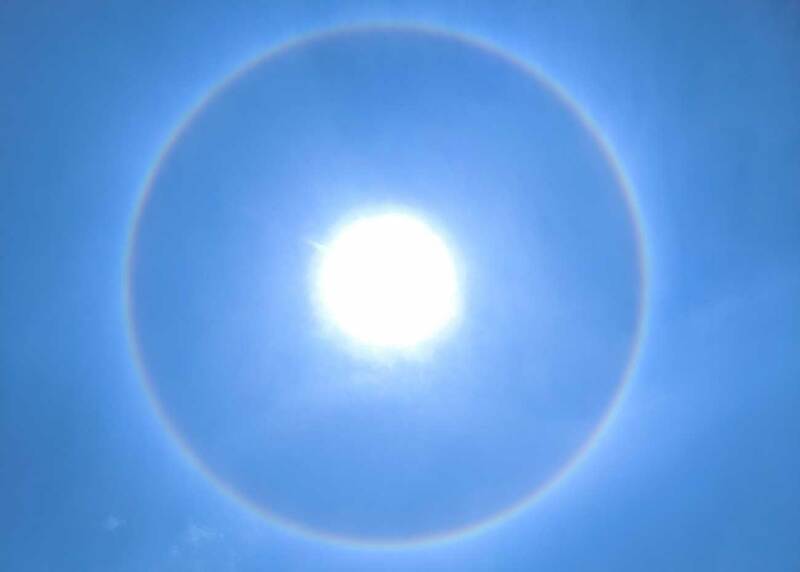 After all, we did catch this awesome 22 degree halo (rainbow around the sun) at Ao Nang Beach! The sunsets can be spectacular as well. More on that below. This is a Buddhist temple with tall Buddha statues, tiger paw prints in the nearby cave and a very strenuous flight of stairs to get to it. Once you’ve made it up the stairs then you’ll have a great view of the surrounding area. We personally didn’t make it to the temple during our stay, but it’s a short trip from Ao Nang and we’ve heard that it’s well worth it! 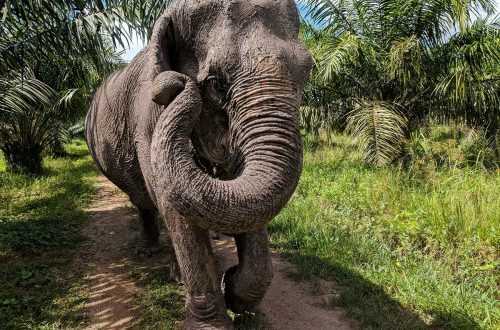 Many companies offer Elephant rides but we think your money would be better spent going to a sanctuary (Elephant rides are cruel to the elephants). There are very few Sanctuaries in Krabi and we recommend Krabi Elephant Sanctuary. At the time of this post they were still a new establishment but seemed to have their hearts in the right place. Do not get them confused with Krabi Elephant House Sanctuary. At elephant sanctuaries you can feed, bathe and walk with the elephants. It’s an incredible experience that you don’t want to miss out on! 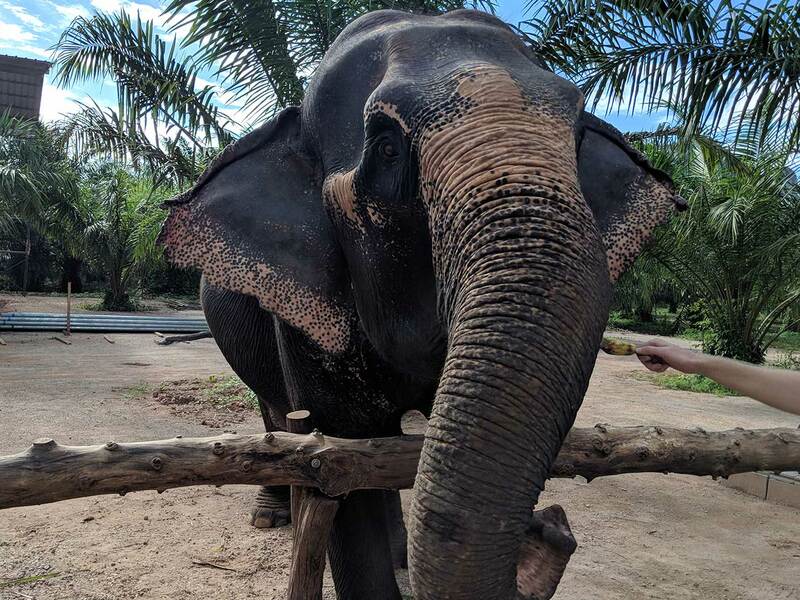 You can read more about our experience at Krabi Elephant Sanctuary here! Ao Nang is a short boat ride to many beautiful islands. You can buy a longtail boat ticket to Poda, Tub, Chicken and Hong island for 300-500 baht round trip. These islands offer little or no food but they’re worth the trip for the white sandy beaches and crystal blue waters. Not technically an island but still one of our favorite places you can only reach by longtail boat is Railay. This town is situated between cliffs and has plenty of restaurants, activities, lodging and, of course, beautiful beaches. 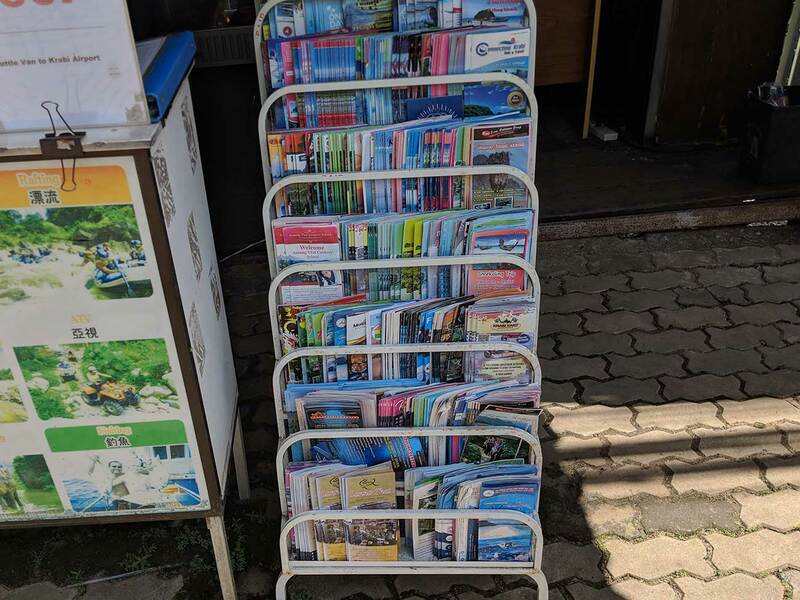 There are so many tourist booths along the main street of Ao Nang that offer more tours than you can count or even think about going on (try to avoid the jungle trekking tours that include elephant riding). You can do anything from kayaking the monkey-filled mangroves, go on a sunset dinner cruise, island hop to James Bond Island and so much more! Just like massages, they will say hello to you as you pass to try to get your attention. If you can think of it, a tour booth probably offers it. They are all very friendly and will try to accommodate you to get your business. Some booths even offer laundry service, which we definitely used since we stayed for a month. If you ever walk the streets of Ao Nang prepare to be hounded by massage parlor ladies. They don’t get in your way or actually disturb you, but your ears will be ringing with the word “massage” after about five minutes. That said, make sure to take them up on it sometime! A Thai massage is a unique experience because you get a good stretch while also getting massaged. For example, they take your legs and press them against your chest, almost like athletes stretching before a game. We chose to have our massages on Ao Nang beach and got the aloe vera massage, which was only 400 Baht for an hour. That’s around $12 USD for a whole hour! Another thing to watch out for with massages, they’re going to try to sell you everything else they offer, like extra feet scrub, tours to islands, tours to temples, etc…. These all cost extra, of course, and they’re just trying to make that dollar. But it kind of kills your relaxation. Nonetheless, a Thai massage is a must while in Ao Nang. 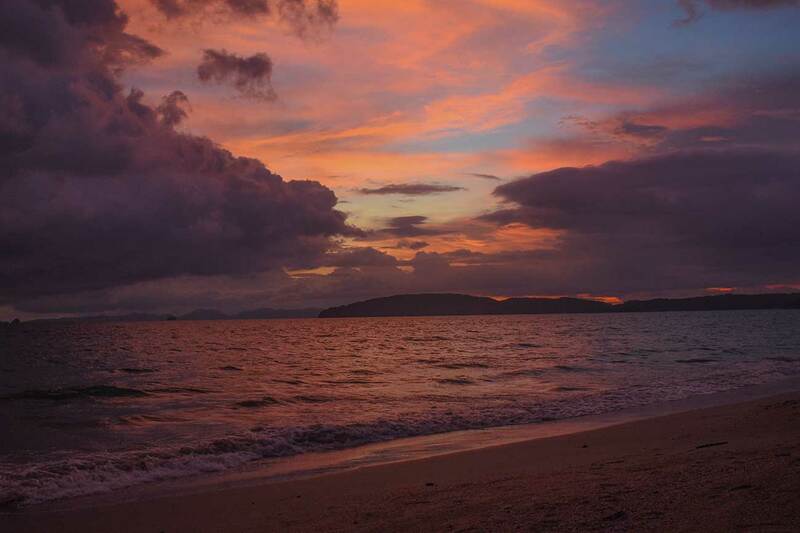 You can watch the sunset from many locations, but it’s hard to beat Ao Nang Beach for this. With such a huge stretch of sand and if the tide is low, you’re in for a real treat. Oh, and if it’s not cloudy. We were in Ao Nang in September and October, their most rainy months. Still, we saw some breathtaking sunsets that we will remember. If you’re staying on Railay then how lucky you are. We wanted to watch the sunset from Railay West Beach, but the last longtail heads back to Ao Nang at 5pm, making this impossible unless staying there. Either way, look to the west at dusk and enjoy! We read that Thailand is a great place to get scuba certified. There are many great dive sites close by and a handful of dive shops in Ao Nang. If scuba diving isn’t your thing but you still want to get a glimpse of underwater life then consider a snorkeling trip! Many of those tourist booths we mentioned earlier have a plethora of snorkeling trips to offer. 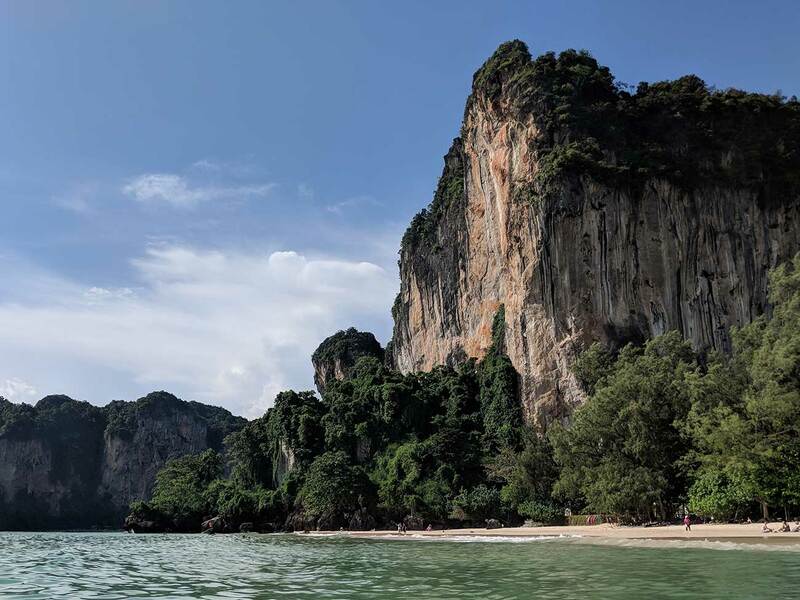 With so many limestone cliffs jutting up from the ocean and providing a backdrop while you sunbathe on the beach, it’s no wonder that Krabi is a great rock climbing destination. We did not rock climb, but there are a ton of tour groups offering this activity and from what we’ve heard and read, it seems like it’s a very safe activity here. While beaching at Phra Nang Cave on Railay, we witnessed a rock climbing excursion behind us. It looked like a lot of fun and most importantly, safe. 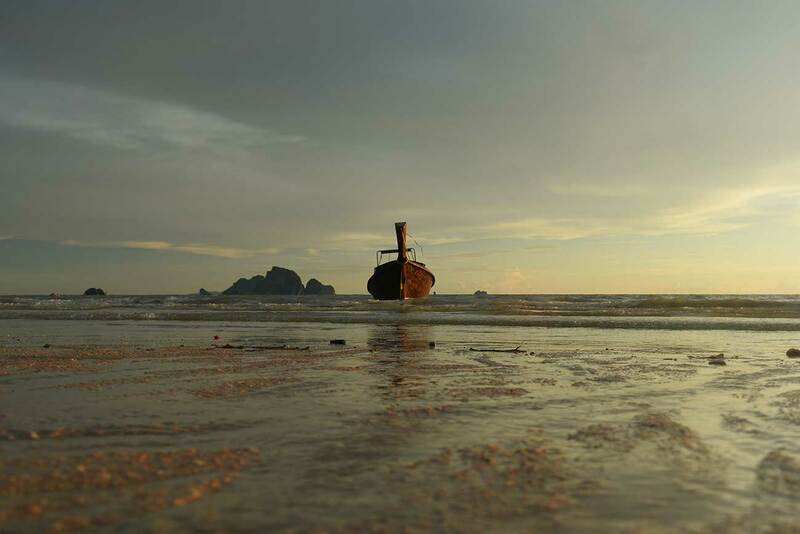 With so much to enjoy in the beautiful expanse that is Krabi, Ao Nang is a great place to base. 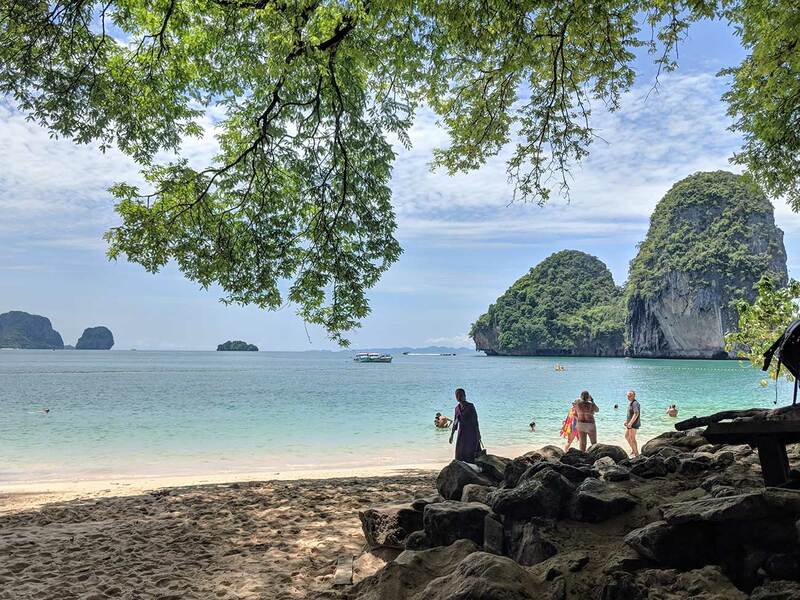 Whether you’re staying here for the short or long term, Ao Nang allows you easy access to Krabi’s gorgeous islands, as well as the jungle and cliffs that surround you. Have you been to Krabi? Tell us about your experience below! Your trip sounds amazing! Food is always the first thing on my mind when I travel, but the beaches sound as deliciously wonderful. Thanks for letting me live vicariously through you with this post. It was an amazing trip! Glad you enjoyed reading about it 🙂 We hope you get to go someday because great food and beaches are the best combination!